We recently headed up to Glasgow for the first ever Mix Inspired event. This fresh, new, knowledge-based seminar event looked to inspire, inform and entertain. Our guests represented the leading organisations from the A&D, D&B, dealer and general property market in Glasgow. We’re delighted by the response we received from the audience on the night – and also subsequently – with everyone learning something new (us included), meeting some great new people, having a bit of fun – and our specifier friends were even able to pick up some CPD points along the way. We would like to thank our sponsors – Connection, Interface and Johnson Tiles – for their fantastic support, everyone at The Lighthouse (what a venue!) and of course our audience for sparing their valuable time. 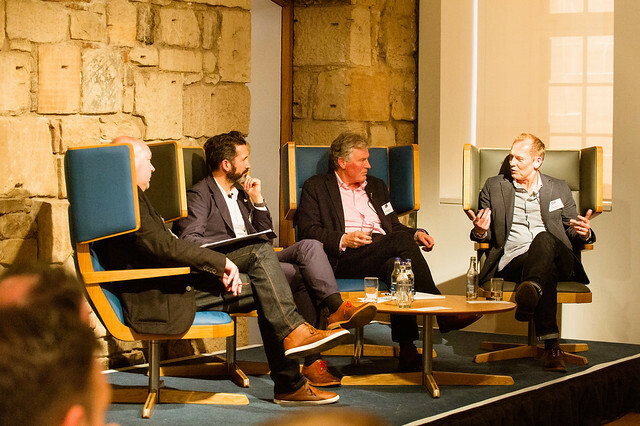 Last, but by no means least, we must thank our expert panel – Oliver Heath, Haa Design’s Chairman and MD, Hugh Anderson, and Craig Whittet – Programme Leader, Product Design Engineering at the GSA. For us it’s Manchester next – but we’ll certainly be back in Glasgow in the not too distant future. Click on the image below to view all of the photos from the event.